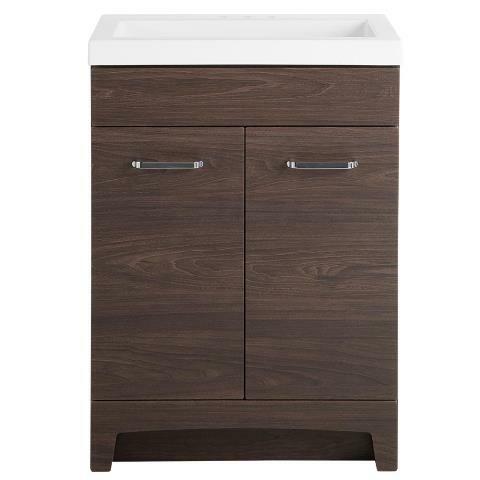 Ideal for the modern home, the Glacier Bay Stancliff vanity in an Elm Ember finish and Solid White vanity top is a contemporary-style vanity combo adorned with 2 modern flat slab panel doors. The 24.50 in. Stancliff vanity fronts feature a deep black, brown Elm Ember coloring with a natural wood-grain like rigid thermofoil finish and a uniquely designed cultured marble integrated rectangular bowl. Paired with 2 brilliant satin nickel pulls, the Stancliff vanity will effortlessly pull your bathroom together.